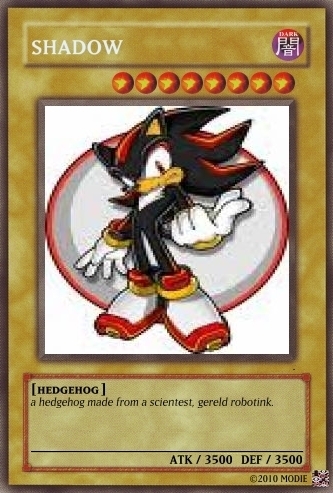 shadow yugioh! card. a shadow yugioh! card i made myself. Wallpaper and background images in the Shadow The Hedgehog club tagged: yugioh! shadow. This Shadow The Hedgehog photo contains anime, comic book, manga, and cartoon. OHHHHHHHHH MMMMMMMMMMMMMMYYYYYYYYYYYYY GGGGGGGGOOOOOOOOODD!!!!!!!!!!! THANK YOU SO MUCH GEROLD ROBOTNIK FOR CREATING THE MOST HOTTEST THING EEEEEVVVVVEEEEEERRRRRRR!!!! I LOVE YOU!! I LOVE YOU SHAAAADDDDOOOOOOOOOOOOWWWWWWWWWWWWWW!!!!! !­!